Quite well, if you get one with 4-wheel drive (4WD). We expect most buyers who live in areas where it snows to select this option as opposed to the standard rear-wheel drive configuration. A rear-drive pickup truck isn’t well suited for driving in the snow because all the engine’s power is going to two wheels with very little weight above them – true especially with nothing in the pickup bed. Placing something heavy in the bed – sandbags, cinderblocks – helps, but not nearly as much as having 4WD to supply traction power to all four tires. Four-wheel drive really is the way to go if you want proper snow handling. 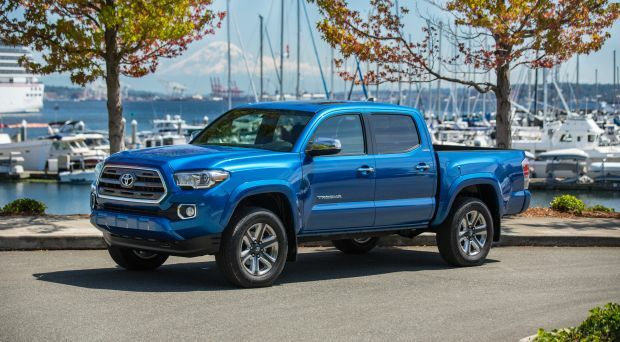 In common with most compact pickups, Tacoma’s 4WD system is part-time. Unlike all-wheel drive or a full-time-4WD system, it operates in 2WD until the driver turns a dashboard knob to engages 4WD. Note that part-time 4WD lacks the differential action that allows each wheel to turn at its own speed during cornering, so it should be used only where the surface itself allows some slip, such as on gravel or, yes, in snow. Left engaged on dry pavement, the drivetrain could “bind” in turns, a potentially damaging situation. The high ground clearance of a 4WD Tacoma – some 9.4 inches – is a further weapon in deep snow. However, the available off-road-oriented all-terrain tires, such as those on the new-for-2017 TRD Pro model, likely won’t give you as much grip as the all-season tires fitted to most Tacomas. All-terrain tires are optimized to throw off mud and claw over rocks; their chunky tread blocks can become clogged with frozen slush, actually reducing traction in the snow. If you want a manual-transmission Tacoma, you’ll have to get 4WD. The combination can be a boon in the snow, allowing you the option of starting off in second or even third gear, masking torque and encouraging the tires to grip before they slip. Tacoma’s closest rivals, the Chevrolet Colorado and Nissan Frontier also have part-time 4WD and should handle similarly in the snow. Interestingly, Colorado’s corporate cousin, the GMC Canyon, offers full-time 4WD, which can be left engaged on dry pavement while also offering a low-range gear for heavy-duty off-road use. Canyon’s setup has a dashboard switch with an “Auto” mode, which allows the truck to operate like an all-wheel-drive (AWD) crossover with no further user input required. The Honda Ridgeline is a bit unconventional. In addition to being the only truck of any sort to be available with front-wheel drive, it also uses a crossover-type AWD system. It has a traction management switch that can adjust the behavior of the AWD hardware to suit different surfaces, including snow, mud, and sand. It can also apportion power to individual wheels, rather than just between the front and rear axles.